If you’re thinking about finishing your degree after dropping out, you may have some hesitations, even though you know it’s the key to higher wages for entry-level positions, and that the median weekly earnings for bachelor’s degree holders are nearly double that of high school graduates. You know the benefits, but you also know first-hand that earning a degree can be a challenge. It may feel hard to see yourself as a “traditional” college student. Fortunately, colleges and universities are now better equipped than ever to serve the needs of non-traditional students, including adult learners like you. Working adults are returning to school to finish college at an unprecedented rate, and educational institutions are doing everything they can to support them. For example, many colleges and universities now offer student orientations to assist students who are returning to the classroom after an extended absence. These types of orientation programs review institutional policies but introduce students to additional campus support staff and departments. Students at many universities also have career and academic advisors at their disposal to assist them in developing a personalized roadmap to graduation based on their unique background, needs, and goals. The assistance available to help you successfully transition back to college can also redirect your future in ways that you probably haven’t considered. The well-documented benefits of finishing your bachelor’s degree aren’t limited to career advancement or improved salary potential. You’re also likely to experience increased self-esteem, for having accomplished a goal that seemed out of reach. Complete your degree and you might be inspired to attempt other pursuits you’d previously dismissed. If you’re concerned that you don’t have enough time or money to complete your degree, or are worried about juggling your many existing commitments, there are a variety of ways to overcome these challenges. Apply the following strategies to return to school and help you finish your degree sooner than you think. Identify the exact reason you’re returning to school to complete your degree. What’s stirring your renewed interest? Did you stumble upon a dream job, only to find that it required a more advanced degree? Is it the limited earning potential of jobs at your current experience and educational level? Or when you left school the first time, did you swear to yourself that you’d finish your degree…someday? Keep the reason for your decision (also known as your “why”) at the forefront of your mind and revisit it on at least a weekly basis. A regular review of your “why” will be the key to successfully returning to school and completing your bachelor’s degree. Online degree programs offer the flexibility not found in a traditional classroom setting. Since there is not a designated class time, you can complete coursework on your own schedule as defined in the course syllabus. Check out the online program offerings of your prior institution. If they don’t offer the online coursework for your intended major, perform an online search for accredited schools that do. Self-paced learning, faster completion times, and the ability to work around your current job and family commitments make online degree programs a great option for adult learners. Your employer might help with funding your degree. Some employers offer tuition reimbursement as a recruiting tool, hoping to attract and retain employees by adding this perk to the employee benefits package. Contact your human resources department to see if your employer has a program to help pay for the cost of finishing your degree. Program eligibility requirements vary, so it’s important to learn about these details before enrolling in classes. If your employer does not offer tuition reimbursement, it may be worth considering changing jobs, especially if you were already planning on changing careers. A tuition reimbursement program could mean up to $5,250 a year (or more) towards your tuition bill. And if you use your employer’s annual tuition reimbursement limits wisely, you could drastically reduce the cost of returning to college. For example, instead of taking four classes per semester and having to pay for one out of pocket, you might consider only taking three and having your semester fully funded by your employer’s program. It may mean completing your remaining coursework over a longer period, but in the end, you could end up paying less for your degree. You do not repay the funds received from tuition reimbursement programs; however, be prepared to pay for your tuition upfront. Reimbursement timelines will be described in your employer’s written policy. You can also alleviate your financial concerns about returning to school by combining institutional scholarships, grants, and personal savings with tuition reimbursement programs. Don’t try to foot the bill on your own. Complete a Free Application for Federal Student Aid (FAFSA). You may be eligible for federal grants and loans even if you were ineligible during your prior college years. If you’re not interested in taking out loans, your tuition reimbursement program may still require the completion of the FAFSA. Remember, the FAFSA will also help decide federal grant eligibility. Contact the school’s financial aid office for questions about how to submit the FAFSA and determine your eligibility for Federal Student Aid. Many students prefer to enroll part-time during their first semester to help ease back into college. Check on the requirements for part-time enrollment by talking to an admissions representative and review the school’s catalog to confirm the minimum course load requirement for half-time students. Some Federal Student Aid programs require at least half-time enrollment to maintain eligibility. Part-time enrollment moves you closer to completion while allowing you to maintain a sense of balance. If you were overwhelmed in your first pass at a degree, it’s important to avoid falling into the same patterns this time around. And, don’t be discouraged if you feel your progress is too slow—if you have 16 semester hours left to complete your degree, you could be done in less than a year. You may be hesitant to return to school, and that’s understandable. Once you return, you may continue to have doubt about your ability to finish your degree. Here’s where a “cheer team” comes into play. This team consists of family, friends, and coworkers who will help encourage your progress along the way. Let those you’re close with know in advance that you’re returning to college. You’ll need their support since their lives will be affected as well. Have a meeting to discuss your intentions and make sure everyone is on board. Don’t forget friends as a support system. They need to understand they’ll see less of you since more of your time will be dedicated to coursework. Reassure them that your absence is only temporary. When things seem overwhelming, you’ll need the support of your entire cheer team. Your prior education can reduce the time to finish your degree. You don’t need to start from scratch unless you failed all your prior coursework, which is unlikely. Follow the school’s transfer credit policy which may require the submission of official transcripts from your former institutions. Speak with the admissions office to make sure all transcripts are received so every possible credit can be applied. Transfer credit acceptance may ultimately influence where you enroll. The more transfer credit you receive, the less money you must pay for college. Transfer credit is an excellent way to take advantage of the time you’ve already spent in college and save money at the same time. Meet with a student services advisor at your prospective school so they can help you design a tailored degree plan. When speaking with the advisor, share your “why”. Your personal and career goals can be used to better customize which classes should make up your degree, when to take them, and how this will fit with your current work and family commitments. This might mean enrolling in summer or half-term courses to finish your degree quickly. Student services departments are there to help traditional and non-traditional students complete their degrees as scheduled. A bachelor’s degree is within your reach if you first know the “why” behind your decision to return to college. From there, use the remaining strategies listed here to support your decision and change your life. 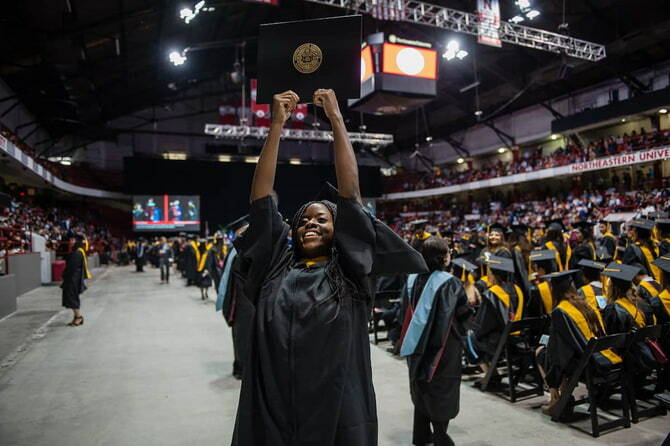 To learn more about earning a bachelor’s degree from Northeastern, explore our degree completion programs, or connect with our team to have your questions answered.